I may have a very limited number of hatching eggs from my blue/black/splash bantam Ameraucanas. The young (2010) roo is a gorgeous dark blue with very fine lacing, and was hatched from Heavenly Springs Farm (BYC Little Ameraucana Mom) champion show bird eggs out of Indiana. He has bay eyes and black legs, and a nice pea comb. The 2010 black hen is also from the Heavenly Springs flock, and her color is just lovely. She has bay eyes and black legs. Both birds fit the breed standard. The 2010 red-shouldered splash hen is a project bird sired by a red-shouldered splash roo from Kentucky, out of one of my silver duckwing bantam Ameraucana hens. (This color is not yet listed on the breed standard.) Her mother came from a flock in Portland, TN that had been carefully bred for several generations for body color and deep blue egg coloring. This young hen's body color is just lovely, and I feel she is well worth working with to achieve that beautiful splash pattern. Her eyes are a bit too dark, but her body type is nearly identical to my black hen. She is already throwing splash chicks. It is entirely possible you may occasionally get a throwback color from this hen, though. Both hens are laying lovely, good-sized blue eggs. All three birds are friendly, inquisitive, and are among the most docile birds I have. If you love working with blue/black/splash coloring and want an interesting bantam project with good-quality birds, eggs from this group might be a good opportunity for you! I am not shipping eggs at this point in the winter, but please feel free to contact me if you are in the area and wish to pick up. I will update this page later in the spring. 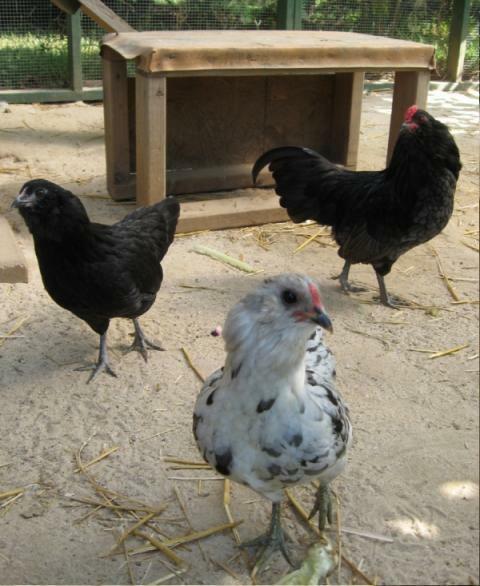 Do you have any blue/black/splash ameraucana bantams for sale?